Whether you have a laptop, tablet or mobile phone, constant software updates probably form a daily part of your life. 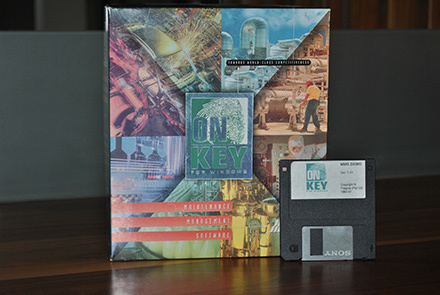 Imagine our surprise when we discovered a floppy version of our software still operational since it was first installed in 1996 at one of our client’s plants in Epping, Cape Town. “I was both astonished, impressed, and excited at the same time – 19 years far exceeds the average life-cycle of most software products, even those of Microsoft. If I had not seen recent screenshots of the software running on a PC, I would not have believed it,” says Senior Analyst Programmer Barry Theunissen. The Overall Equipment Effectiveness (OEE) module, still in action today, was developed as a supplement to On Key, Pragma’s enterprise asset management system (EAMS). It calculates the OEE metrics for machines, production lines and factories and assists manufacturers in keeping track of their assets’ effectiveness and to identify problem areas quickly, which can affect return on investment (ROI). Pragma Chief Executive Officer (CEO) Adriaan Scheeres came up with the idea behind this module. The concept was brought to life by Barry who was tasked to take ownership of the development with inputs from Ronnie Taljaard, Pragma’s International Services and Consulting Managing Director. At the time, Ronnie was one of the senior asset management consultants in the Pragma team. “With the next release of On Key, the OEE functionality will have largely the same functionality as the original product, but with a better and newer user-interface using more modern software, architecture and database technologies,” says Barry. 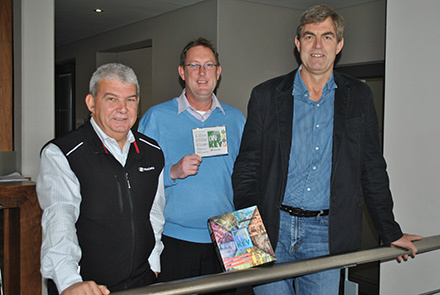 From Left the right: Ronnie Taljaard, Barry Theunissen and Adriaan Scheeres. “I believe that multinational companies who require the ability to monitor and manage OEE on a global scale, from a centralized position will benefit greatly from this software solution. Smaller customers will still be catered for and the nature of our product will enable them to scale as their businesses grow,” says Ronnie. Organisations can face huge risks when they operate their physical assets without critical asset information. In many organisations, keeping accurate details associated with physical assets, such as asset attributes, configuration, condition, valuation and location, is an ongoing challenge. As a business tool, On Key addresses this need. During the past two decades, a dedicated team has been hard at work to improve On Key continuously. While its core function is to serve as a supreme asset register, it also records the condition of the assets and facilitate work management transactions. The asset register allows organisations to optimally design maintenance tactics in order to improve the performance of their physical assets and minimise unplanned downtime. On Key is often integrated as the computerised maintenance management module into a broader information technology architecture. In addition to On Key, Pragma offers a suite of services, asset management business processes, asset management assessment and roadmap consulting as well as extensive asset management training courses that are effectively integrated for delivering asset management services to organisations. For more information, visit www.pragmaworld.net.